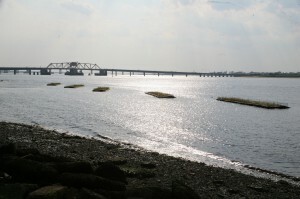 The Jamaica Bay Wave Attenuators are intended to protect critical salt marsh wetlands along the shore. 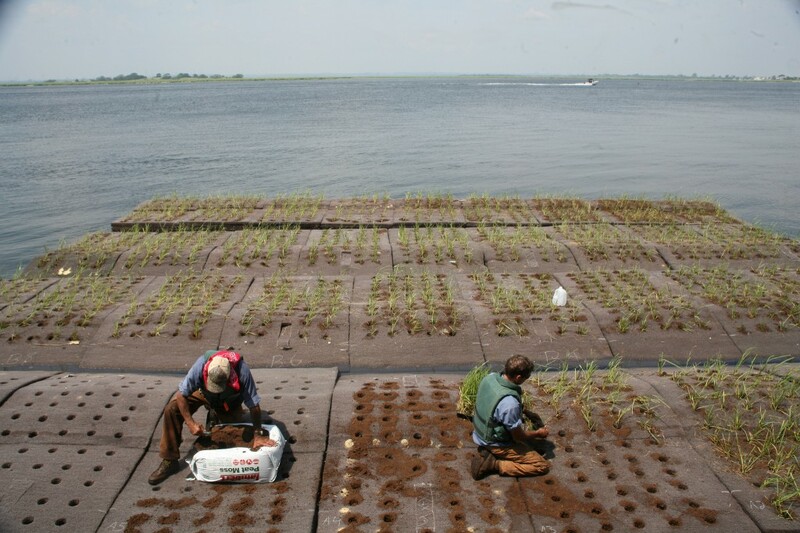 New York City Department of Environmental Protection (DEP) is using floating, vegetated wave attenuators in Jamaica Bay. The attenuators are part of a pilot project to study the efficacy of deflecting and reducing wave energy to protect critical salt marsh wetlands. The 2-year pilot program will cost approximately $500,000 and will inform future shoreline protection efforts. The attenuators, installed in mid-September on the Rockaways, are each approximately 12 m long (40 ft long) and anchor to the seabed about 30 m (100 ft) off-shore. They are angled to deflect waves produced from prevailing northeast winds. DEP is using remote acoustic monitoring devices to measure the effectiveness of the attenuators. Additionally, the department is measuring the anticipated decline in erosion along the wetland edge. Information collected from this pilot program will help determine whether oyster beds could be planted in other areas to similarly protect critical shoreline wetlands. Prior to the installation of the attenuators, the remote acoustic monitoring devices measured the wave energy off Brant Point for 30 days to provide a baseline. The devices will now continue to monitor the wave energy after the installation of the attenuators for the next 2 years. Over the last 150 years, Jamaica Bay has lost a significant amount of marsh and wetland area due to several factors, including sea level rise, dredging and filling throughout the bay, a loss of sediment, and increased tidal heights. Many of these changes permanently have altered sections of the bay. As such, DEP has partnered with several non-profit organizations to restore habitat along the periphery of Jamaica Bay to meet the goal of creating highly productive ecological areas and improved habitat. Is there anywhere we can get an update on this study? I’m highly interested in hearing or teasing about this interesting project. i’m interested in hearing about or teasing about the résultat if this experience. My phone corrects my words. I never wrote teasing but reading.